Establishing and Publishing an Online Peer-Reviewed Journal: Action Plan, Resourcing, and Costs, Dr. Lorna Shapiro (2005). The findings of an independent analyst, whose work not only highlights the strengths of OJS, but also answers many questions others will have in the early stages of starting a journal, including the critical issues of time, costs, and planning. Getting Found, Staying Found, Increasing Impact: Enhancing Readership and Preserving Content for OJS Journals, Kevin Stranack (2006). This document shows OJS publishers how to raise their journal’s profile, and suggests strategies for the preservation of their content. Online Guide to Open Access Journals Publishing (2010). 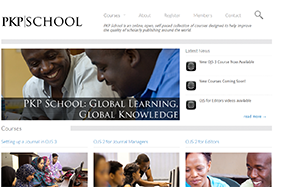 The online guide is directed to small independent teams and provides practical information on planning, setting up, launching, publishing and managing an open access scholarly journal. Starting a new Scholarly Journal in Africa, Kevin Stranack (2006). Considers the promise, possibilities, issues and technologies involved in starting a new scholarly journal in a developing country setting. Starting an Open Access Journal: a step-by-step guide, Martin Eve (2012). A five-part introduction to starting an OA journal in the humanities — although it is useful for all disciplines. Created by the Hybrid Publishing Lab at the Centre for Digital Cultures at Leuphana University, allowing you to get an idea of the various aspects of Open Access journal publishing at a glance. Want to learn more about running a journal? Sign up for our free, online, self-paced courses!